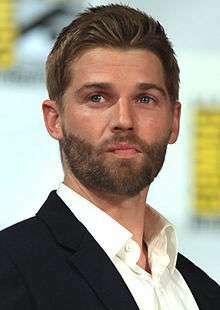 Michael James "Mike" Vogel (born July 17, 1979) is an American actor and former model. Vogel began acting in 2001, and has since appeared in several films and series, including The Texas Chainsaw Massacre, The Sisterhood of the Traveling Pants, Grind, Poseidon, Blue Valentine, The Help, Bates Motel, Cloverfield and Under the Dome. Vogel was born in Abington Township, Pennsylvania, a suburb of Philadelphia, to Kathy and Jim Vogel, and was raised in Warminster Township, Pennsylvania. Both of his grandfathers fought in World War II; one was a tank commander who fought in the Battle of the Bulge, and the other was a Seabee in the Navy. Vogel has two younger siblings: A brother, Daniel Aaron, and a sister, Kristin. He attended William Tennent High School, the same high school as Sprint spokesman Brian Baker and boxer Kermit Cintron, where Vogel was on the Freshman wrestling team. During the early 2000s, he frequently traveled to New York City in order to audition for acting roles and modeling slots. Vogel began modeling for Levi's, and was subsequently cast in the television series Grounded for Life appearing in a recurring role between 2001 and 2004. His first film role was in the skateboarding-themed Grind, which was released on August 15, 2003. The film's co-stars included Adam Brody and Jennifer Morrison. Vogel's next role was in the made-for-television remake of Wuthering Heights, which premiered on MTV a month after Grind's release, in September 2003. In the film, Vogel played Heath opposite Erika Christensen's Kate. Vogel's last 2003 role was in the remake of The Texas Chainsaw Massacre, which was released in October to high box office performance. In 2005, after Grounded for Life was canceled, Vogel appeared in four film roles. First, he played Eric Richman, the romantic interest of Blake Lively's character in The Sisterhood of the Traveling Pants, which had a June release. His next role was the lead in the low-budget film, Supercross, which was theatrically released in August. Vogel filmed his role in Havoc, a dark, R-rated drama also starring Anne Hathaway, in 2003, but the film was not released until November 2005, when it bypassed theaters and was released directly-to-video. Vogel's final 2005 role was in Rumor Has It..., starring Jennifer Aniston, in which he had a supporting role as the son of Kevin Costner's character. Vogel's first 2006 role was in the disaster film Poseidon, a remake of the 1972 film The Poseidon Adventure; he plays the fiancé of Emmy Rossum's character. The film, which had a budget of $160m, opened on May 12 and grossed $181,674,817 at the international box office. Vogel was originally offered the role of Angel in X-Men: The Last Stand, but backed out to appear in Poseidon. The same year, he appeared in Caffeine, a romantic comedy and signed to appear in a horror movie called Open Graves, shot in Spain. In 2007, Vogel appeared in the film The Deaths Of Ian Stone, part of the horror film festival 8 Films to Die For. In 2009, Vogel starred in the neo-noir film Across The Hall and the horror film Open Graves. He was part of the 2010 romantic comedy film She's Out of My League, Blue Valentine, TV series Miami Medical and Heaven's Rain. Vogel was part of the 2011 comedy film What's Your Number? and plays Johnny Foote in the film adaption The Help. He most recently played Dean on the short-lived ABC drama Pan Am (based on the defunct airline of the same name). In 2013 he participated in Howard Goldberg's comedy Jake Squared where he plays against among others, Elias Koteas, Virginia Madsen and Jane Seymour. He also appeared in McCanick, and the first six episodes of Bates Motel, A&E's contemporary prequel series to the 1959 novel Psycho. BuddyTV ranked him #96 on its list of "TV's Sexiest Men of 2011". Vogel also starred as Dale "Barbie" Barbara on the CBS science fiction drama series Under the Dome, based on the novel of the same name by Stephen King. The show aired as a summer series on CBS and it lasted for three seasons on the network, ending in September 2015. In 2014 he received a role in The Hallmark Hall Of Fame's romantic TV movie In My Dreams, in which he plays against among others, Katharine McPhee and JoBeth Williams. In the same year played in the drama thriller The Boy, which tells the story of a 9 year old Sociopath, which was played by Jared Breeze. In 2015, Vogel starred in the Mini Series named Childhood's End based on the novel Childhood End, written by Arthur C. Clarke. Vogel married Courtney, a former model, in January 2003, with whom he has three children: Cassy Renee Vogel, born 2007; Charlee B. Vogel, born 2009; and Gabriel James Vogel, born 2013. The family resides in Nashville, Tennessee and has 1 pug, Olivia, and 2 horses, Mr. Benjamin Buttons and Mr. Ghost. ↑ "TV's 100 Sexiest Men of 2011". BuddyTV. Retrieved January 13, 2012. ↑ "The Boy". Bloody Disgusting. Retrieved January 13, 2012. 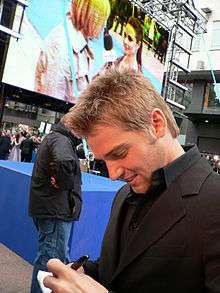 Wikimedia Commons has media related to Mike Vogel.